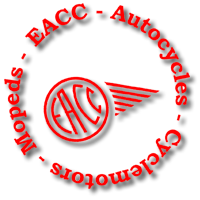 The EACC's aim is to promote interest in and enthusiasm for all types of autocycles, mopeds, cyclemotors and other motorised cycles, the older the better. It also encourages the use, preservation and restoration of these types of machines. Membership is open to anyone interested in these vehicles. There are some suggestions below about how to define a moped, cyclemotor or autocycle but most definitions get a bit blurry around the edges; for example, does a moped have to have pedals? A good rule of thumb is that EACC members are interested in anything that has a ridiculously low power. The cyclemotor, or motorised bicycle, dates back to the dawn of motor cycling in the last years of the 19th century, but the boom period for these machines was undoubtedly the 1950s. The cyclemotors of this period usually consisted of a small engine (under 50cc) that could be attached to a normal bicycle. The positions used by different manufacturers were many and various: above the front wheel; above, alongside or inside the rear wheel; or between the pedals are typical examples. The final drive was often a roller rubbing on the bicycle tyre but other, more positive, transmissions were used. The EACC caters for enthusiasts of cyclemotors from all periods from the 1890s to the present day, but it is the 1950s that the majority of our members is interested in. Probably the most well known of the cyclemotors, the Cyclemaster was a complete powered wheel that replaced a bicycle's normal rear wheel. The earliest models had a 25.7cc engine; this was increased to 32cc for later versions. Nearly a quarter of a million of these machines were built in the UK between 1950 and the early 1960s; several other countries also produced their own versions of the Cyclemaster. Another popular type, built under licence in England by Trojan to an Italian design. 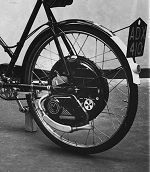 The 49.9cc Mini-Motor was mounted above the cycle's rear wheel and drove it by friction roller. Mounted in the same position as the Mini-Motor and also using a roller drive, there were two models of Power Pak: the Standard and the Synchromatic, which had the sophistication of a twist-grip operated clutch. The most popular of the earlier cyclemotors; the Wall was produced from 1912 until the mid-nineeteen-twenties. It consists of an engine and wheel mounted on its own frame and fitted alongside the bicycle's rear wheel. The SMITH Motor Wheel and BRIGGS & STRATTON Motor Wheel were developments of the Wall. Other models of cyclemotor include: BSA Winged Wheel, Vincent Firefly, Ducati Cucciolo, Berini, Cymota and many more. For more information on cyclemotors, try a visit to the Moped Archive. The autocycle is a lightweight motor cycle with pedals, very similar to the mopeds of more recent years. The autocycle was developed between the wars and, by the mid-1930s, had adopted a design which changed very little until the end of production in the mid-1950s. Autocycles are usually powered by 98cc engines; most examples used the Villiers Junior, Junior Deluxe or 2F engines. The most notable exceptions to this were the Cyc-Auto and the Excelsior Autobyk, which used their own make of engine, and the HEC, which was powered by a Levis engine. Because of the universal design it can often be difficult to differentiate between different manufacturers' machines. 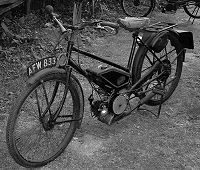 Most manufacturers of autocycles were also motor cycle builders, some of the best known being: James, Norman, Rudge, New Hudson, Raynal, Francis-Barnett and Excelsior. For more information on autocycles, try a visit to the Moped Archive. The moped is a motor cycle with an under-50cc engine. The first mopeds were equipped with pedals but legal definitions of the moped have changed over the years and nowadays encompass almost any under 50cc motor cycle. Mopeds originated on the continent in the mid-1950s and soon ousted their predecessors, the autocycles and cyclemotors, from the market place. Introduced to Britain from Europe during the mid-1950s, machines such as the NSU Quickly and Mobylette were quick to catch on. 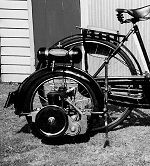 British makers such as Norman, Phillips and Raleigh were soon building their own mopeds to compete. 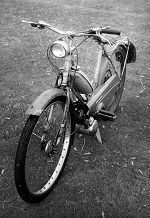 There were very many different makes of moped produced during the 1950s and '60s although many of them used the same engines such as Sachs, Jlo and Rex. Surviving examples of some of the more obscure manufacturers' products are quite rare nowadays. 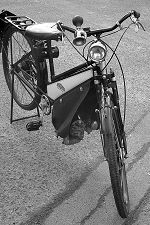 Sometimes classified as an autocycle and sometimes as a cyclemotor; the VéloSoleX, with its engine above the front wheel, is the second most popular motor cycle of all time. The Moped Archive also contains a lot of information on the VéloSoleX. The membership fee for the UK is £3.00 per year. You can use this Membership Form (PDF document) or you can sign-up on-line with a debit card, credit card or PayPal.